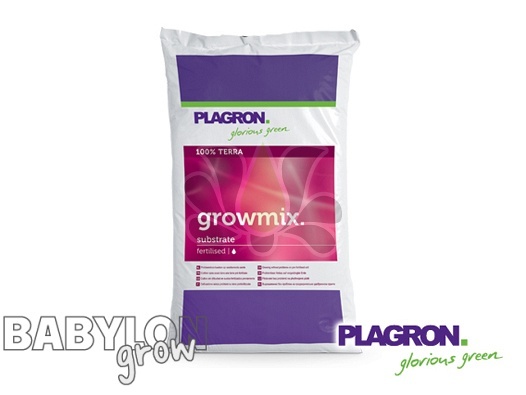 Plagron Growmix is a mix of the fi nest, carefully selected types of peat. It contains various types of fi bre and perlite which results in a lightness and oxygen level you have come to expect only of Plagron quality substrates. The abundant presence of unique Plagron worm castings ensures vigorous plant growth and increased water retention. The nutrients that have been added to the Growmix consist of a carefully selected combination of fertilisers which meet all the needs of the plant during the fi rst three weeks. Growmix is the perfect base for optimum growth and blooming and delivers the quality Plagron has been supplying for years. Best quality peat for a light soil structure. Pre-fertilised for 3 weeks with a refi ned combination of nutrients. Grower decides on fertilisation during the fl owering phase. White peat moss, black peat moss, peat moss fi bre, perlite, worm castings. 1.8 kg/m3 mineral NPK-fertiliser (12-14-24). Do not fertilise during the first 3 weeks. 25 and 50 litres bags. Because of the heavy weight of the growing media, we are unable to mail it abroad.